New members are always welcome. Anyone who paints or draws and is interested in meeting other artists with similar interests is welcome to come as a guest and “try us out”. A Studio 30 member attends club meetings, helps with our art shows and becomes involved in the club activities. Membership Dues are $100 from September to December and $65 from January-May (Half-year). Membership dues cover the Club’s meeting expenses plus rental and insurance costs of the Club’s Art Shows. Members do not pay commission to the club for any artwork sold. 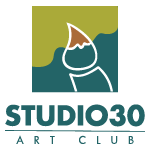 For information on joining Studio 30 contact the Club Vice-President, Linda Butcher at 250-479-0953 or fill in this form below.